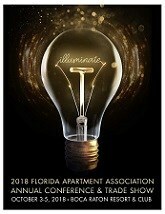 The 2018 FAA Annual Conference & Trade Show, October 3-5, at Boca Raton Resort & Club, in Boca Raton, Florida, is the premier state conference for the apartment industry. More than 900 multifamily housing industry professionals interested in sales, marketing, recruitment and retention, maintenance, career development, leadership, customer service, technology, and more, will be inspired by the nationally renowned keynote speakers and the breakout sessions. Attendees can expect to make great connections and share insights on relevant and current hot topics within the industry during the many networking opportunities. The FAA trade show with 170 exhibit booths offers attendees innovative solutions firsthand from more than 500 knowledgeable suppliers displaying products and services that will put attendees in a position to gain market share and grow their bottom line. Click here to view the confirmed exhibitors and sponsors. Keynote Speakers Announced for 2018 FAA Annual Conference & Trade Show: Entrepreneur "Johnny Cupcakes" Earle and marketing duo Linley & Lauren will be keynote speakers at the 2018 FAA Annual Conference & Trade Show October 3-5 at the Boca Raton Resort & Club. Click here to learn more. Please note: Attendee registration will open on Monday, April 2.